The Speakerphone audio plug-in gives you authentic speakers of any size together with their natural environments. All the walkie-talkies, distant transistor radios, upstairs TV sets, bullhorns, cell phones and guitar cabinets you will ever need. Speakerphone (a plug-in for MacOS and Windows) will add dial tones, operator, static, and you can select from a wealth of ambiences on either the caller or receiver's end. 400 speaker impulse responses, 23 microphones, 106 'Covers' (from blankets to car trunks), 53 Altiverb rooms and outdoor spaces, 5 gigabyte of ambiences and sound FX, and 12 DSP modules from Leslie to GSM compression, conveniently presented to you in well over 500 presets. Take the tour by watching the video here or scroll down for some audio examples. Hit one of the buttons below to listen to the Speakerphone preset. Speakerphone transforming a normal voice recording into an anouncer including environments. Sorry, your browser does not support HTML5 audio. Sorry, your browser does not support HTML5 audio. Sorry, your browser does not support HTML5 audio. Sorry, your browser does not support HTML5 audio. Sorry, your browser does not support HTML5 audio. Sorry, your browser does not support HTML5 audio. Sorry, your browser does not support HTML5 audio. Sorry, your browser does not support HTML5 audio. Sorry, your browser does not support HTML5 audio. Sorry, your browser does not support HTML5 audio. Turning a normal voice recording into a robot. Sorry, your browser does not support HTML5 audio. Sorry, your browser does not support HTML5 audio. Sorry, your browser does not support HTML5 audio. Sorry, your browser does not support HTML5 audio. Sorry, your browser does not support HTML5 audio. Sorry, your browser does not support HTML5 audio. Sorry, your browser does not support HTML5 audio. Sorry, your browser does not support HTML5 audio. Sorry, your browser does not support HTML5 audio. Sorry, your browser does not support HTML5 audio. Sorry, your browser does not support HTML5 audio. Sorry, your browser does not support HTML5 audio. Sorry, your browser does not support HTML5 audio. Apart from choosing from the hundreds of presets from the preset browser you can shape and mangle your sound extensively combining the many DSP modules. At the heart of the speaker simulator lies a library of recordings of different speakers, often referred to as Impulse Responses, or IR’s. When you click a speaker category icon, like the phone or the radio, a browser window appears that lets you select a speaker in that category. The impulse responses by themselves capture many characteristics, both in frequency and time, of the sampled speaker. 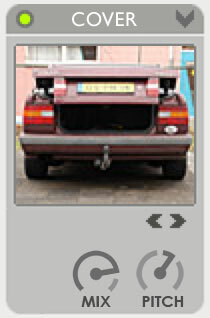 The speaker module lets you select a speaker impulse response, and it shows its corresponding photograph. The more info button brings up additional info on the selected speaker impulse response. You can build complete environments for the speakers right here, via mouse clicks or MIDI. Several gigabytes of samples and music are installed with Speakerphone, free for use in your production. 5 tables of twelve samples are accessible at a time for playback via mouse clicks or MIDI. 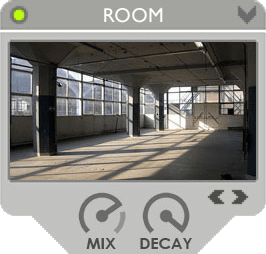 The samples range from extras like knobs and closing car doors to ambiences and music, and they are used throughout the presets that come with Speakerphone. You can drag samples from the sample bay to your tracks and vise versa. And you can add your own library as well. The Wet Dry control gradually moves between processed and unprocessed (Bypassed) sound in a very elaborate way. A movement from WET to DRY will gradually open up filters, including the speaker IR, and diminish the effects of modules like Distortion and Codec each in a unique way. The overall result of a movement from WET to DRY is a seamless ‘opening’ up of the sound from the complete preset to unprocessed sound. If, for instance, you have your mix sounding from a jukebox in the back of a bar, you can slowly ‘open up’ the sound to full stereo buy dragging the WET/DRY slider. Or click the right most KICK text to make the slider move from wet to dry, automatically, at a speed determined by the KICK slider. Emulate a speaker's or amplifier's over modulation. 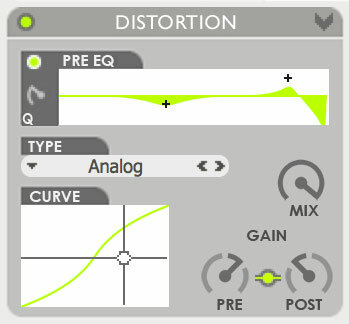 In the distortion module audio is first passed through the Pre EQ: a parametric EQ and a low pass filter with resonance. Next, the signal hits the PRE gain, which typically amplifies so the waveform will become more or less distorted in the next module: the Distortion Type: amp models, wave shapers, all of them are further controlled using the CURVE graph at the bottom of the distortion module. 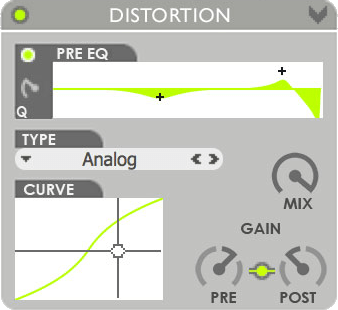 POST-gain controls the distortion's output volume. You can also click the connection-button in between PRE and POST to have post gain automatically decrease when pre gain increases and vise versa. 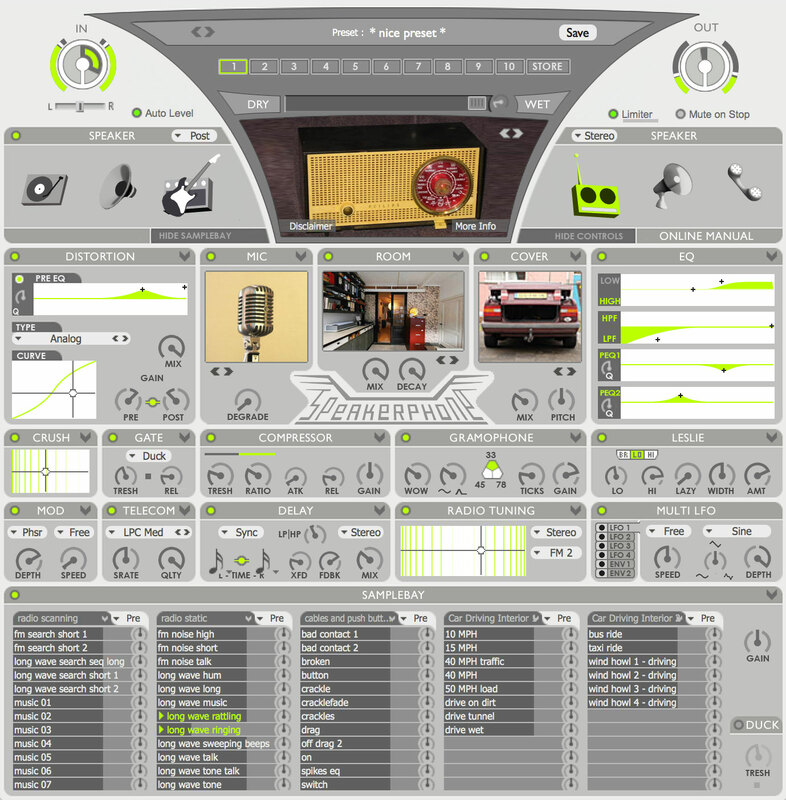 Convolution reverb, powered by Altiverb, for room, outdoor space, hall, resonant enclosure, and reverb gear simulation. 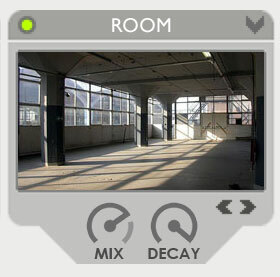 Room creates reverb based on recordings of actual spaces ranging from a railway station hall to the cockpit of a MIG fighter plane. Samples of spring and plate reverbs and even real outdoor streets are available as well. A variety of objects can cover a sound source. Blankets, suitcases, boxes, glass cups, car trunks, walls are just few. The pitch of these resonating little acoustics can ben adjusted. (Cellular) phone connection protocol simulation. Apart from emulating cell phones the codec can be tweaked to make whispering presets, robots and vocal synthesizer effects. Classic gate, you can set it to duck or entirely mute the input. This can be used to create connections that drop out, to clean up guitar input, etc. Emulate the pumping of video cameras, enhance the guitar input signal and there are presets for the extreme types of compression that are present in walkie-talkies and megaphones. Five types of frequency filters. Low and High shelving filters, High pass filter and low pass filter and two bands of parametric equalization with adjustable q-factor. The modulation (mod) module offers five types of classic modulation effects, available in the top left popup. These are: Tremolo, Chorus, Phaser, Flanger or Vibrato. 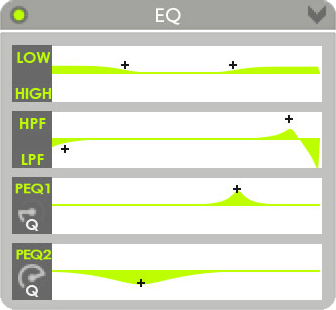 DEPTH controls the amount of the modulation effect. SPEED controls how fast the modulation oscillates. Speed can either be set in FREE mode or in SYNC mode. SYNC ties speed to the host sequencer's tempo and displays it with a note value. Simulates the various effects of a radio receiver dial. Vertical movement of the cross-hairs changes the frequency of inter-modulation side tones, and when the cross hair is moved out of the horizontal center, the reception of the signal worsens (distortion and noise is added). Similar to the speaker selector, but here a microphone impulse response can be selected. The available microphone time and frequency characteristics of the microphones depicted, and therefore make it sound as if the selected microphone was used in the result. 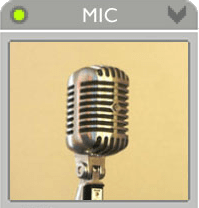 Use it to make an announcer speak through a typical announcer microphone, or to pick up a guitar cabinet using a classic microphone for the purpose, for instance a Royer. Word length reduction and sampling rate reduction. Drag the cross hair down to reduce word length (reduce from 32 bit input to 2 bit output). Move to the left to reduce sampling rate. To maximize aliasing effects the most crude of sample rate conversion algorithms lies beneath the Crush module. Influence a pitch curve due to 'Wow' (effect of an off-center hole) and Curve (a bumpy record). Also Add ticks and crackles that knock holes in the input audio. This module emulates a Leslie speaker, typically associated with Hammond organs. Mono or stereo feedback delay with a high pass or low pass filter in the feedback loop. The delay can be synced to host tempo, in which case the delay time rotary knobs are exchanged by notes. Clicking on a note then brings up a note-value selector box. The Cross feed parameter determines how much of the left channel signal gets fed into the right channel delay path. Four Low Frequency Oscillators (LFO) and two envelope followers (env) for automated parameter control. 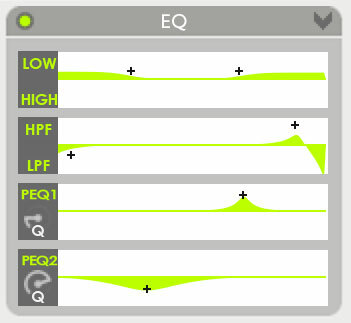 Simply click and drag a cable to a parameter that you want to control with the LFO. The speed can be synced to the host's tempo and there is a wealth of different waveforms to choose from. All plug-ins are available in 32 and 64 bits. Speakerphone comes with 5 GB environment samples for authentic speaker simulation. Speakerphone now checks for a new version (at audioease.com) by using https. This update adds 64 bits support to Speakerphone 2 on Windws (including AAX). And like on Mac, Speakeprhone 2.1 on Windows now requires the iLok 2 key. This update is fully backward compatible with Speakerphone 2 (and 1). It reads the presets, settings and automation and sounds the same. New smartphone, tablet and flatscreen TV speaker IRs added ! 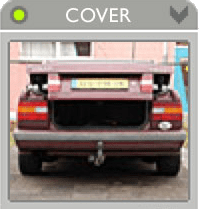 Fixed bug in preset browser: a single click opens the user section. * a speaker selection bug in Speakerphone 2.0.0 prevented some Speakerphone 1 sessions to come up with the wrong speaker selected. The bug is fixed, but the consequence is that sessions made with speakerphone 2 may load with the incorrect speaker selected, so please double check which speaker is selected in the speaker module. Solves a muting problem introduced by the 1.1.2 update. Solves a graphics problem in the Speakerphone 1 interface that occurs in Pro Tools 8 in Mac OS X 10.5 when you use a control surface. This release benefits from the same fixes mentioned in last weeks Speakerphone's 1.1.1 Mac update release notes. preset change faster then ever before! Speakerphone 2 requires the iLok USB Key (2nd generation or newer). Sit down and takes this amazing trip with Arjen showing you around in Speakerphone 2. Search and find what you need to know in the Speakerphone 2 pdf manual. Check the Speakerphone 2 end user license agreement. 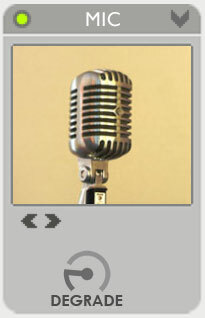 Listen to speakerphone plug-in presets applied on a studio recording. Check if the Speakerphone plug-in will run on your system. Please note an ilok 2 (or newer) usb key is required. Answers to your questions, background information, see the faq below.